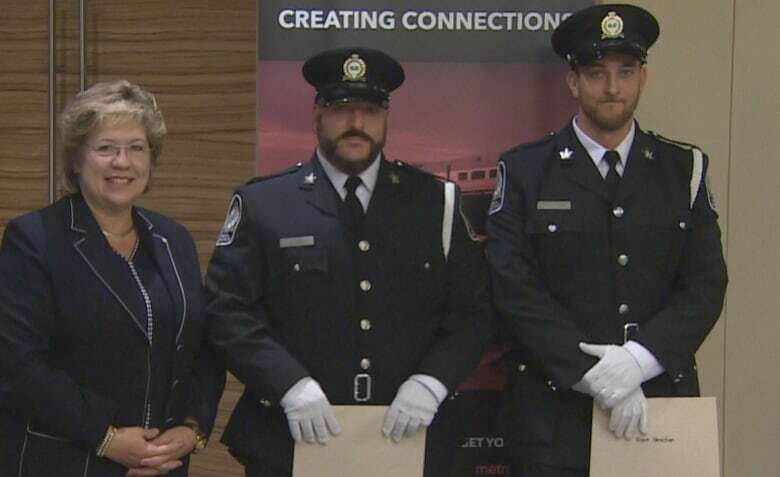 When three GO Transit special constables started their shift Aug. 5, they had no idea they would take down an armed robber and ultimately be honoured for their bravery. 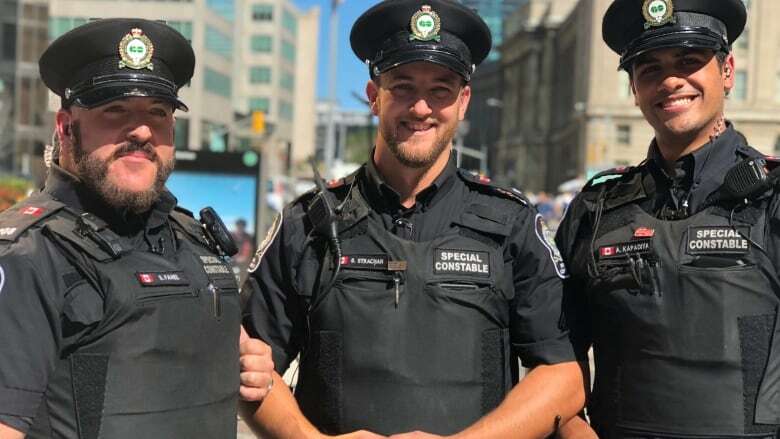 When three GO Transit special constables started their shift Aug. 5, they had no idea they would be forced to intervene in an armed robbery and ultimately be honoured for their bravery. Stephan Fahel, 37, Brent Strachan, 32, and Arjun Kapadiya, 25, were recognized Friday at a Metrolinx board meeting for their "heroic" actions. "It's always nice to be called a hero, but... we're all heroes because the people I work with would have done exactly the same thing," said Fahel. "It's definitely nice to hear it, and it's definitely nice to be appreciated for it, there's no doubt about it. We help people every day and we just do it because it's what we love to do," he said. On the night of Aug. 5, the outdoor summer market in front of Union Station was bustling. The Caribbean Carnival was in full swing and the Taylor Swift concert had only let out a couple hours earlier. Just after 1 a.m., Fahel said he and Strachan heard a chaotic scene developing and rushed to break it up. They quickly realized it was a robbery in progress and as they ran towards the scene, the suspect ran at them. "Within seconds, if not milliseconds, we realized we were involved in a much more serious situation," said Fahel. "It wasn't until I got very close to him and noticed the gun pointed right at my chest." Fahel immediately screamed out, "Gun, gun, gun!," but his partner of about eight months had already lunged at the suspect to tackle him to the ground. The pair was able to take down the armed suspect with nothing more than their batons and the help of a third special constable, Kapadiya, who happened to be in the area and also rushed in to help. "Life and death, essentially ... all he had to do was pull the trigger," said Fahel. "We're super fortunate that he either didn't decide to do it or he didn't get a chance to do it." The suspect allegedly ripped a thick gold chain from the victim and stole his cash, police say. Metrolinx said the victim was an American tourist and the chain was valued at roughly $30,000. Fahel said they are just happy no one was injured during the violence. "You sit back now and you realize, 'Wow, that could have went differently, but it didn't,'" Fahel said. "We walk by this place every day, so we relive it every day." "Because it happened so quickly, they basically were going hand-to-hand combat to secure the individual," said Staff Sgt Dave Durant, senior supervisor of Transit Safety Operations. "They really didn't have time to react to the fact that there was a firearm in play," he added. "The fact that they were able to subdue the individual without benefit of a firearm or some other weapon was essentially incredible, but it also shows that their training allows them to react in many different ways to a potential situation." This sort of violent episode is becoming more common for GO Transit special constables, Durant said. 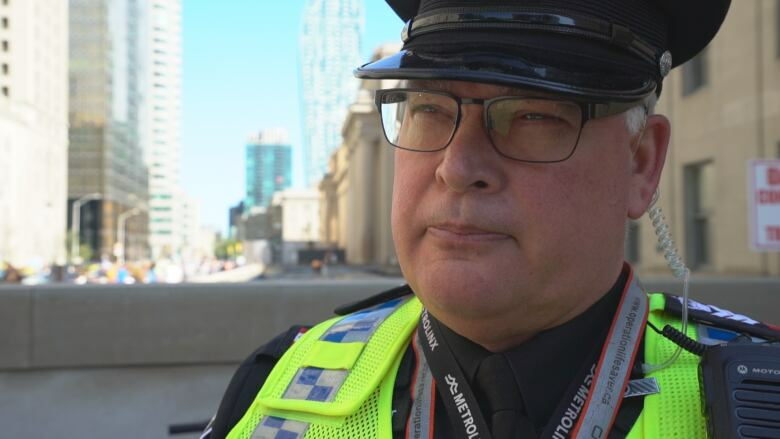 Already this year, he said, Metrolinx constables have dealt with 10 weapons-related calls. Two of those calls involved someone pointing a gun at either a constable or a member of the public. Toronto police said the 22-year-old suspect was charged with 18 drug and weapons charges. The Toronto resident was arrested with about 17 grams of powder cocaine and about 11 grams of crack cocaine, police allege. The suspect appeared in court the day after the alleged robbery, and again on Sep. 10 and did not receive bail. His next court appearance is Sep. 17.